Skeezie, Addie, Joe, and Bobby — they’ve been friends forever. They laugh together, have lunch together, and get together once a week at the Candy Kitchen to eat ice cream and talk about important issues. 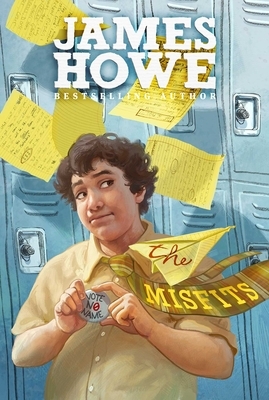 Life isn’t always fair, but at least they have each other — and all they really want to do is survive the seventh grade. That turns out to be more of a challenge than any of them had anticipated. Starting with Addie’s refusal to say the Pledge of Allegiance and her insistence on creating a new political party to run for student council, the Gang of Five is in for the ride of their lives. Along the way they will learn about politics and popularity, love and loss, and what it means to be a misfit. After years of getting by, they are given the chance to stand up and be seen — not as the one-word jokes their classmates have tried to reduce them to, but as the full, complicated human beings they are just beginning to discover they truly are. 1 – Have you ever felt like a misfit? How do you define a misfit and how do the characters fit (or not) your definition? 2 – Did you like or dislike the characters and why? Can you see yourself in any of them? 3 – What is something so important to you that you would go against almost everyone you know? 4 – Were you impressed with the character development of soft -poken Bobby who ended up turning the tide with his honestly?